The pirate theme currently running through Fortnite continues with a new set of Fortnite v bucks generator Buccaneer’s Bounty Challenges, available for a limited time only. Although there is also a Buccaneer’s Bounty Event running at the same time, these challenges aren’t exclusive to the fresh LTMs released every day for that event, meaning you can complete them in any of the competitive game modes. A new Fortnite Buccaneer’s Bounty Challenge is unlocked every day between now and Saturday April 13, meaning we know two of the four challenges so far, and you then have until Tuesday April 16 to finish them off and collect the rewards before they disappear for good. We’ve got details here of all the rewards you can unlock, and what you need to do to beat all of the challenges. 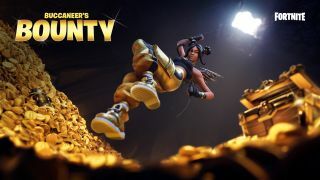 There are a number of rewards to be unlocked by completing the Fortnite Buccaneer’s Bounty Challenges, which naturally follow the pirate theme for this season. The rewards for the four challenges, in order, are an uncommon Plunder glider, an uncommon Pirate Parrot spray, an uncommon banner, and 1,000 XP. Complete all four challenges and you’ll earn the epic Boobytrapped emote, where your character unlocks a treasure chest but then gets slapped about by tentacles emerging from within. You’ll probably have spotted Fortnite Pirate Camps around the island by now, as they are fairly distinctive patchwork buildings decked out with cannons and flying a black kraken flag up top. There are seven different camps in total, which we’ve marked on the map below, and you’ll need to visit one of them in 10 different matches to tick this challenge off. If you want to dig up Fortnite buried treasure, you’ll first need to find a map. Unfortunately, there’s no guaranteed locations to get these, as they’re found as random loot or in chests, so you’ll just need to keep looking around and hope for the best. Once you find a buried treasure map, which takes up one of your inventory slots, select and activate it to display a dotted line leading to where to treasure lies. Follow this to where X marks the spot, then use your pickaxe to dig up the buried treasure chest and search it to complete this challenge. leveling up your Battle Pass and bringing you one step closer to unlocking this season’s secret Legendary skin, Ruin. As usual, there’s an extra incentive to complete as many challenges as you can besides unlocking the new Season 8 Battle Pass rewards. If you manage to clear all of the objectives from a given week, you’ll in turn complete one of this season’s Discovery challenges, earning you a special loading screen that hides a subtle clue pointing to a free Battle Star–which levels your Battle Pass up by one tier–or a Banner–which can be used as a profile icon–waiting somewhere around the island. Clear six weeks’ worth of Season 8 v buck generator challenges and you’ll receive the loading screen pictured below. This one depicts Master Key trying to retrieve one of his keys from a shadowy figure. The key, it turns out, is the clue that’ll lead you to this week’s secret Banner. Look closely at its handle and you’ll see a set of coordinates: E2, E3, F2, F3. The secret Banner will appear where those four coordinates converge, just west of Lazy Lagoon. We’ve circled the exact location on the map below. Glide to the area at the beginning of a match and you’ll be able to find the Banner beneath a tree. Pick it up then finish the match and it’ll be yours to use as a snazzy new profile icon. If you need more help finding it, you can watch where we go in the video above. Like other secret Banners and Battle Stars, there are a few caveats to be aware of before setting out to find the item. Most important, this particular Banner won’t appear unless you’ve completed six weeks’ worth of challenges and unlocked the above loading screen; you won’t simply be able to go to the right area and pick it up unless you’ve done all of the necessary steps. Fortunately, we have tips and guides in our Season 8 challenges roundup if you need help completing any of this season’s missions.